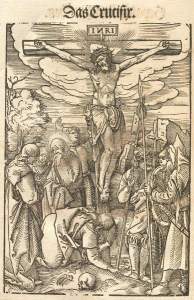 Vogtherr adds a crucifixion scene, copied after Albrecht Dürer. 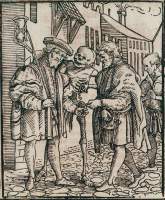 s early as in 1544, Heinrich Vogtherr the Elder (1490-1556) published his copy of Holbein's dance of death in Augsburg. This makes his dance of death the first German Holbein-clone, (unless you include Aldegrever's 8 pictures). 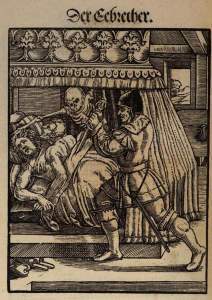 Vogtherr's dance of death is a rather close copy of Holbein's work, except that the images are laterally reversed and bigger. Vogtherr follows the old printed sheets, which explains the German titles. For the same reason he leaves out the astrologer and (naturally) the pictures that were only added to the dance in the later editions from 1545-1562. On the other hand, two new scenes are added: The adulterer and the crucifixion (picture to the right). The sequence is the same as in the printed sheets and departs from Simulachres & Historiées. First comes the scenes from The Old Testament, then ecclesiastics (including the physician), secular men, and women ending with mother and child. In fact the sequence is exactly the same as the so-called printer's proofs in Berlin's Kupferstichkabinett except that the lawyer — rather illogically — comes before the judge. Hans Lützelburger's mark in the bedpost. Vogtherr replaces the mark with the year 1542. The books ends with the signature: »Gedruckt inn der Kaiserlichen Reychstatt Augspurg/ durch Jobst Denecker Formschneyder«. The publisher — Jobst Denecker — here points out that he himself used to work as a block-cutter. 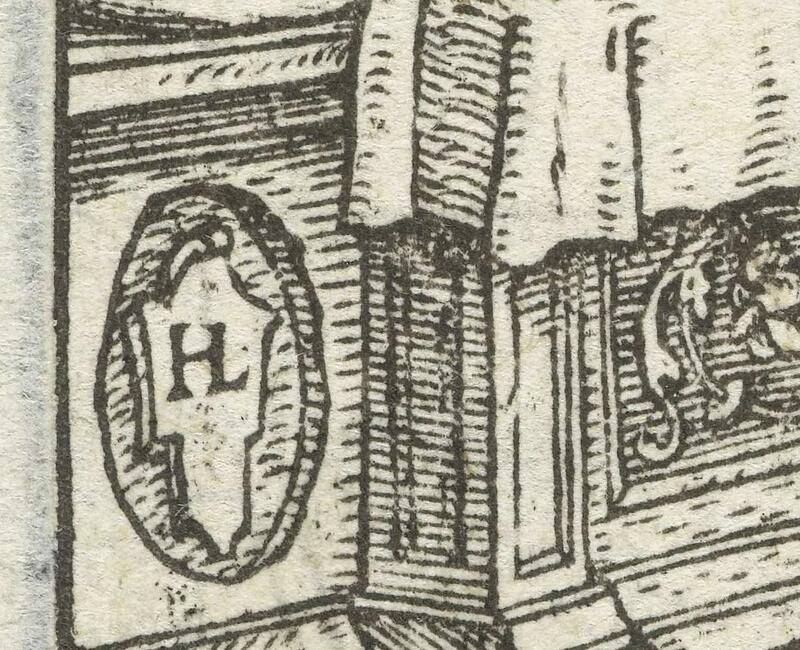 Vogtherr removed Hans Lützelburger's woodcutter's mark: a conjoined H and L in the lower, left corner of the duchess' bed. (see picture to the left). 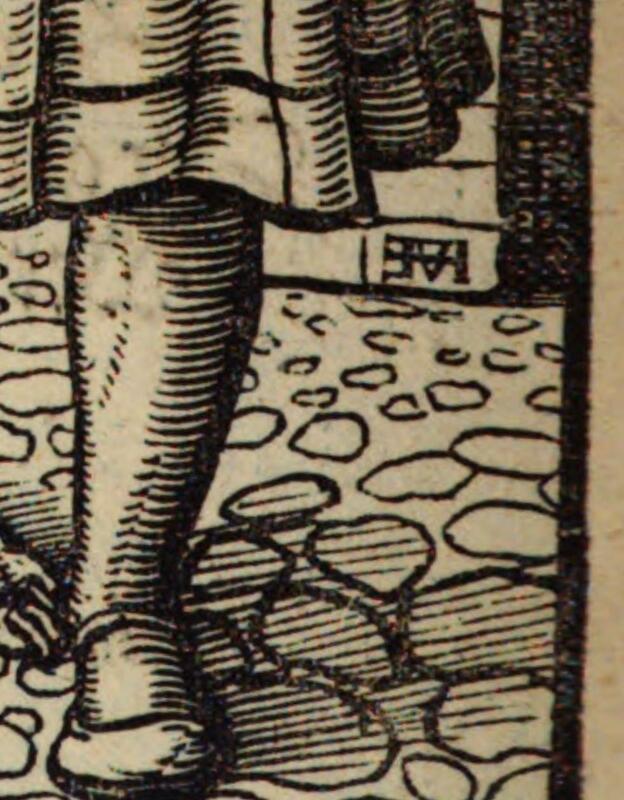 Instead Vogtherr replaced Lützelburger's mark with the year 1542 (picture to the right). Vogtherr then added his own mark — a laterally reversed HVE (Heinrich Vogtherr Elterer) — in the lower right corner of the advocate. Click here for a super-sized image of Vogtherr's advocate. 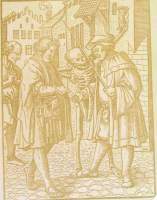 The book starts with a discussion between Death and man, and each picture has a dialogue (in German) between Death and the dying, just as there is in all the "proper" dances of death. This text was included by Carl Helmuth in his copy of Vogtherr's woodcuts and likewise in the copy published by Leonhard Straub in St. Gallen in 1581. The pope from 1548: No letter and no devils. 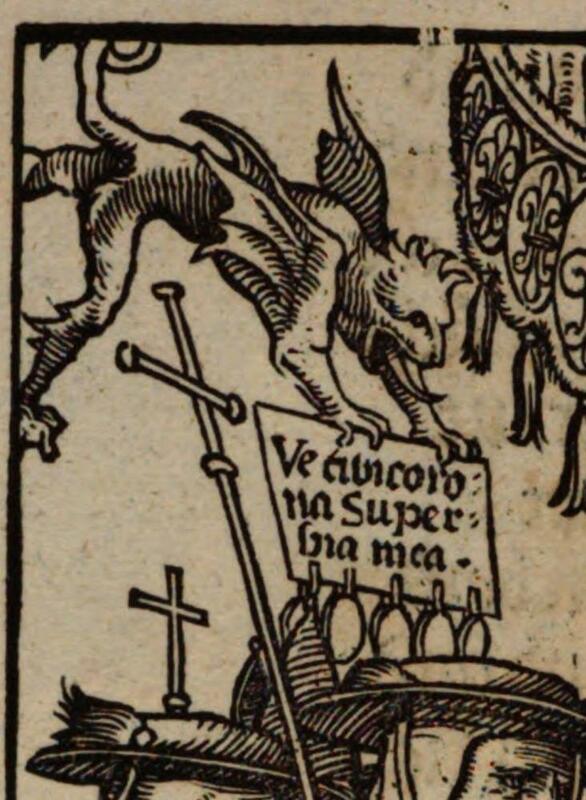 n the woodcut of the pope, a devil comes flying with a letter of indulgence. 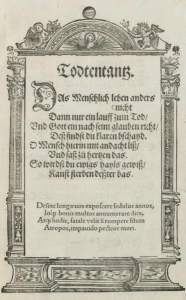 In Holbein's version this letter is adorned with a pseudo-inscription, but in the 1544-edition Vogtherr replaced it with a legible text (picture to the left): "ve tibi corona Superbia mea"; "Woe unto thee the crown of my pride" This sounds like a variation of Isaiah 28:1 "vae coronae superbiae" ("Woe to the crown of pride"). In the next edition, which is from ca. 1548, the letter of indulgence is gone and so are the flying devil and the devil climbing the canopy (picture to the right). The adulterer: The violent version from 1544. The adulterer from 1548: Less drama. 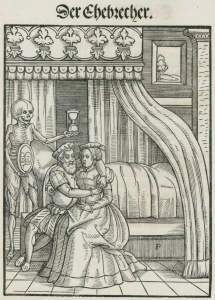 In the later editions it was replaced by more tranquil scene: The same bed and the same room, but the couple are sitting together in the bed while Death holds up a mirror and hourglass (picture to the right). 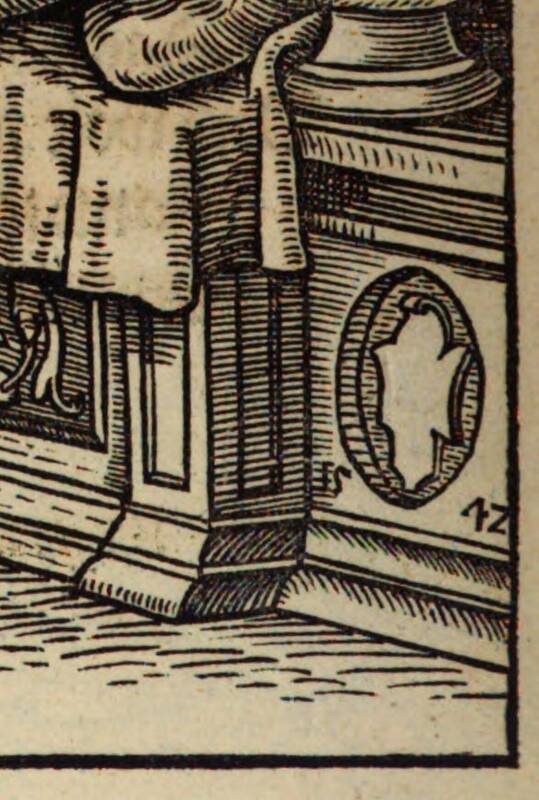 In this new scene, the woodcutter has added his mark at the bottom of the bed: A conjoined JD, short for Jobst Denecker (picture to the right). The book was published in at least three versions by Jobst Denecker, and later on his son, David, published at least two versions. In 1581 the book was copied by Leonhart Straub; in 1836 the text and some of the images were copied by Carl Helmuth. Todtentanz (in Holz geschnitten von Jobst de Necker) Google Books. Good quality, but the first 6 leaves are missing. Todtentanz (in Holz geschnitten von Jobst de Necker). The Austrian national library. Same exemplar as in Google Books (i.e the first 6 leaves are missing). Der Todtentanz mit 42 nicht illum. Holzschnitten - the 1544 edition. The woodcut of the adulterer has been expurgated (and so have the genital areas of Adam and Eve). Todtentanz (in Holz geschnitten von Jobst de Necker). Munich's digital library. Edition from ca. 1548. Totentanz. The Austrian national library. Edition from ca. 1550. The introduction and the crucifixion scene have been omitted. The 40 woodcuts have new text. 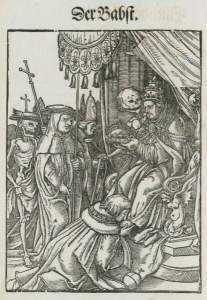 Vogtherr's woodcuts are reminiscent of the so-called "proofs" by Holbein. Vogtherr's woodcuts were copied by Leonhart Straub. Vogtherr's woodcuts were also copied by Carl Helmuth. (Uli Wunderlich, Der Tanz in den Tod, page 73). (Kunst-Blatt no. 76, 22. September 1831, page 302).